← 2011 Best App Ever Awards: Make Your Voice Heard! Steve Jobs believed that all you need are your fingers to take notes on your iPad, but experience will tell you otherwise. 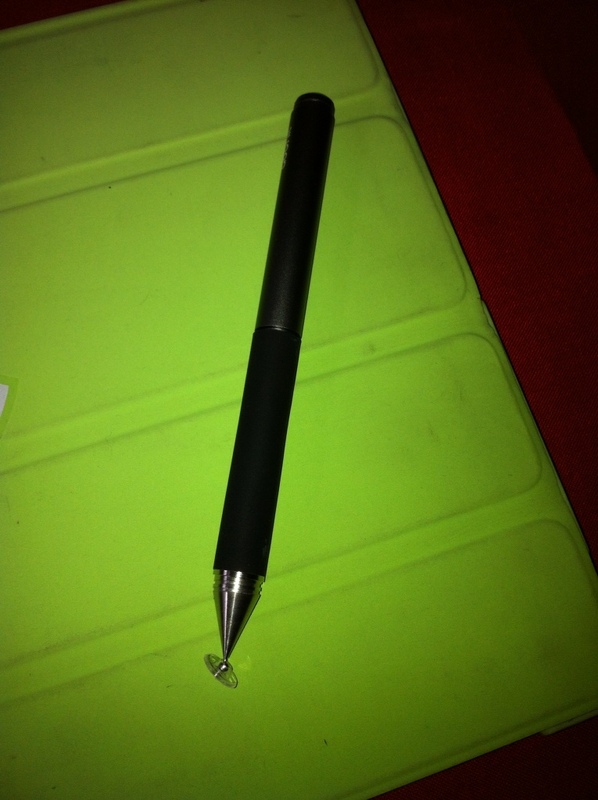 When I got my very first iPad, I immediately looked for a stylus to pair it with and I have been looking ever since. Here are some of my lessons learned. The first part of this series is about my search for a stylus that works for me, and some lessons I can impart from the experience. Just a disclaimer, I have not tried all of the major brands in the market (e.g. Pogo, Dagi, et al. ), just the ones that are locally available or given to me as a gift. The stylus is nothing new. I have seen it since the Jurassic era of computing – when toting a personal digital assistant was the height of mobile tech. Back then, the original stylus wasn’t really effective as a writing instrument, and was really just for tapping on tiny items on a tiny screen. On a larger capacitative touch screen device such as the iPad, however, using one’s own digits isn’t going to cut it especially for lengthy jottings and scribbles. My first stylus, Maclove missile, was short but extendible, with two different tips to choose from (hard and soft rubber), the first thing I learned was to look for a stylus that looks and feels closest to a regular pen. Trying to write was incredibly frustrating, even while using the softer, more pliable tip. I ended up with cramped fingers and stilted penmanship. I passed it on to my boss for testing on his iPhone 4. Unfortunately I don’t have a writing sample to show. Your run of the mill stylus usually comes with a round and soft rubber tip. My second stylus, Targus, is the basic black model close to the length of a regular pen, lightweight and easy to use, which served me well for over a year until a friend of mine told me to test it against a newer Targus stylus. He shared his experience that Targus, works well for basic jotting and writing, but its rubber tip tends to deteriorate quite quickly and his was a lot less responsive down the road. I also tested a similar lightweight stylus by Belkin (which came out a few months ago in our local stores), and so far I haven’t been able to tell the difference between the two in terms of quality and responsiveness. If there are any differences between the two, they are just negligible. My friend got me a more expensive Ozaki stylus pen, which is slightly heavier and hence, takes some getting used to if you’ve been using a lightweight stylus. The rubber tip is also slightly firmer than my Targus. The handy part is being able to use the pen (though the ink isn’t of a high quality type) when needed especially when you’re only armed with an iPad. 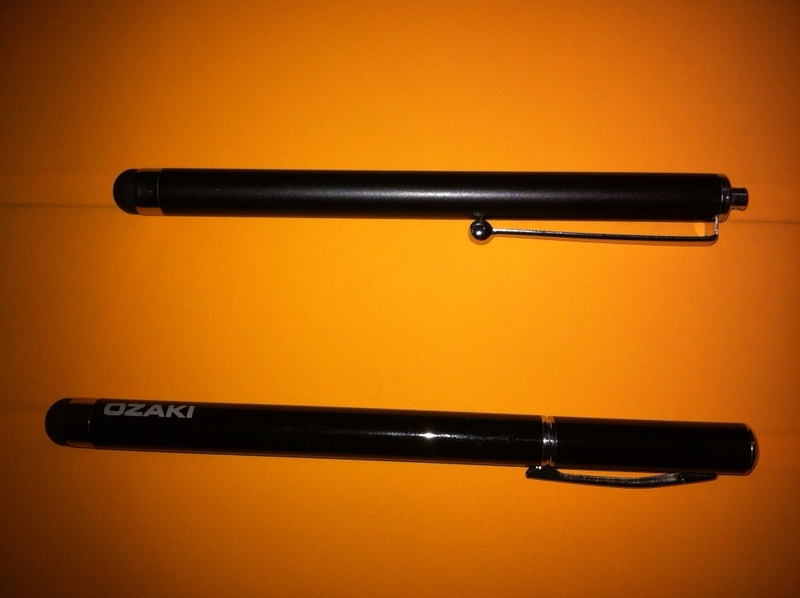 According to my friend who used both Targus and Ozaki, the Ozaki stylus lasts longer and its rubber tip remains intact even with considerable wear and tear of everyday scribbling. Lesson learned: If you’re going to go rubber-tipped, you have two things to consider: price and durability. The cheaper and more lightweight stylus might be more comfortable for writing, but be prepared to replace it sooner than later. Last Christmas, I received an unexpected (but welcome) Christmas present from my brother-in-law. He had mentioned it to me several times after learning I was on the lookout for a stylus that is best for me. When I opened my gift, it was a beautiful metallic stylus that looked like an expensive Apple product thanks to its fine craftsmanship. 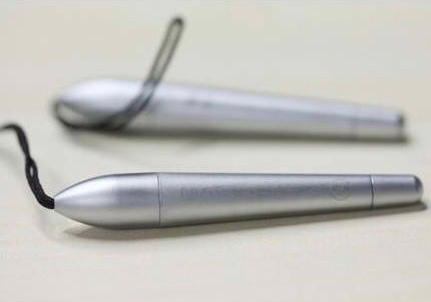 Adonit’s Jot stylus looks like a pen, but you’ll see right away that there is a small plastic disc attached to the tip. Called a precision disc, it moves around when you write and allows you greater flexibility to write at an angle – a maximum of 45 degrees, I believe. It’s not as fragile as it sounds, however, and feels pretty sturdy – in any case, the stylus comes with a cap to protect the tip that you can screw onto the other end when in use. 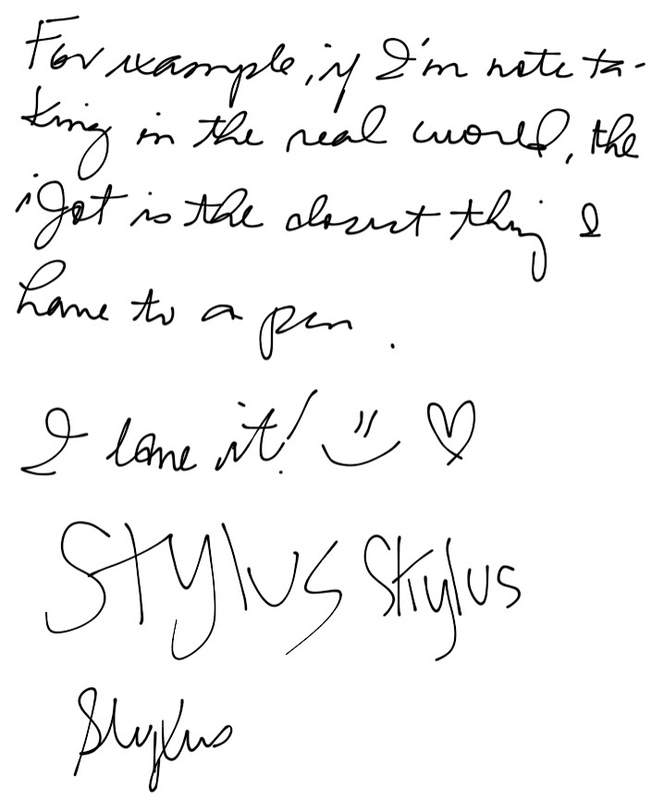 Jot stylus belongs to a particular specie of styli, a cousin of the likes of Dagi, which offer a unique approach to writing on the iPad. Jot and Dagi both employ the use of a plastic disc for greater writing flexibility. Some reviews of the Jot stylus, however, weigh favorably on the greater flexibility of the Jot compared to Dagi. Some also take issue with small scratches on their iPad screen after using Dagi; in my case, since I use a screen protector, I haven’t experienced this using iStroke. Compared to a rubber tip stylus, it takes a lot less effort to write and feels more precise in most instances. However, your appreciation or enjoyment of this type of stylus also depends on your writing style and preference. 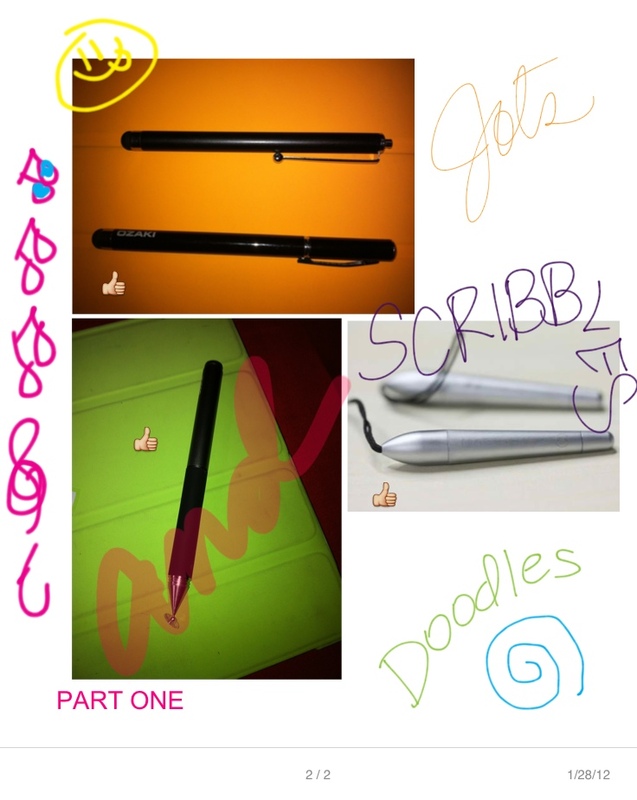 By the way, the Jot stylus, according to my brother-in-law, is preferred by his friends who draw and sketch on the iPad. Lesson learned: If you want a greater degree of precision over what you write, look for a different kind of tip. Of course, finding the stylus that best suits you is just half of it. Stay tuned for the next installments, which will cover some tips on how to maximize your stylus and integrate it into your school and work needs, including a comprehensive survey of note taking apps. Your tips on other brands that I can check out would be most welcome! I use a Targus stylus which I bought some time last year at a PowerMac store. There are those chunky colorful ones too but I think they’re rubber-tipped as well so not sure if it’s worth buying just to test. Nice review, helps newbie choose the right stylus for them.